Targeting an audience on Twitter is critical and no simple task. Fortunately, there are a number of smart tools available that make it easier to connect with your market and build highly curated audience lists. These six steps help you find "your" people and segment them to monitor and engage them more effectively. 1. Target keywords in Twitter bios. Say you're promoting an app for a half-marathon in Chicago. With the help of a few tools you can quickly create lists of your targets. 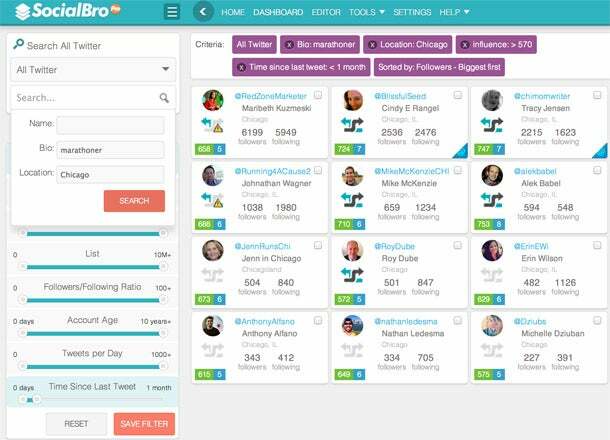 Social Bro: Those with a subscription can search all Twitter bios by keyword (runner) and location (Chicago), name and url to find the active profiles that fit your needs. Additionally, you can organize your search results into Twitter lists. FollowerWonk: With this free tool you can search profiles by keyword, name, location and url. The results can be exported to xls or csv. Twitter's "people search" feature: Any user has access to this recently launched feature, however, searches are limited to keywords. 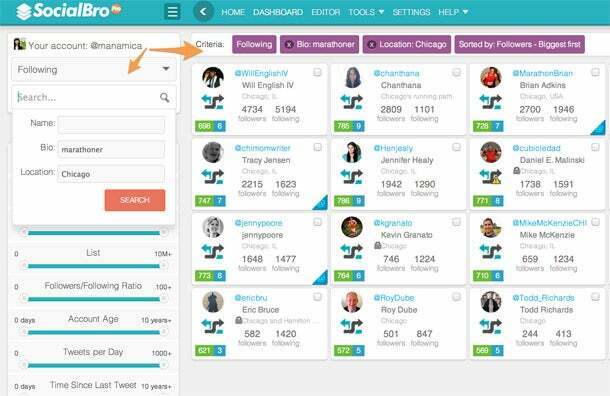 In this example, a keyword and location search on Social Bro shows how you can search for Chicagoans who self-identify as marathoners in their Twitter bio, and who were active on Twitter in the past month. 2. 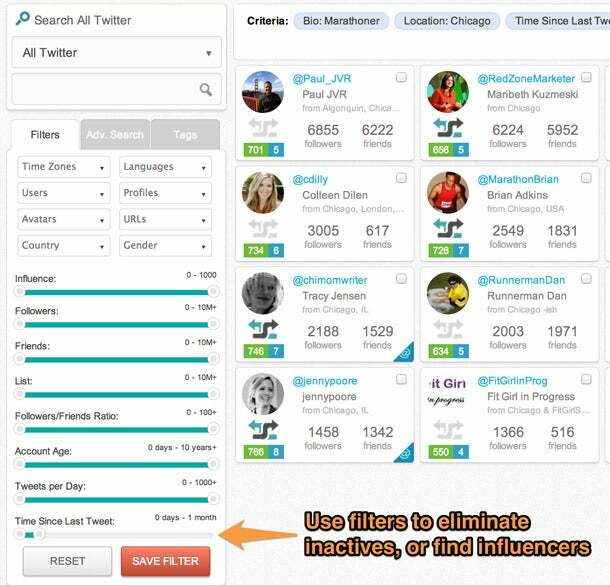 Find active users and influencers. You're creating a targeted list, so for efficiency's sake, it's best to filter out those who haven't tweeted in 30 to 60 days. 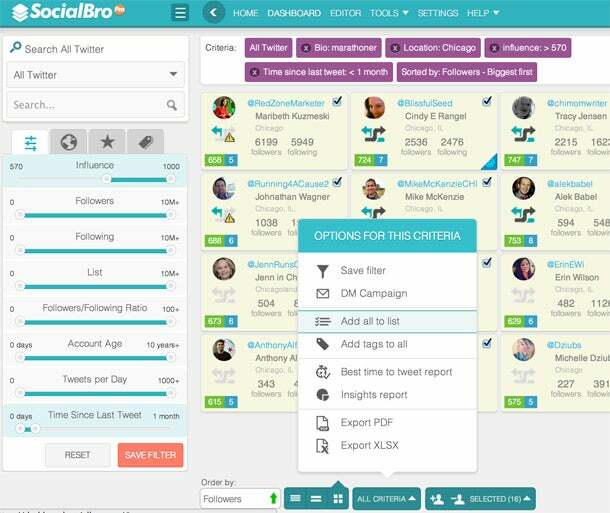 Tools such as Social Bro allow you to select only those who have tweeted within certain period of time (the last month or 90 days, for example). It can also lead you to those with influence or who have a certain number of followers. This Social Bro search filters out profiles who have been inactive for longer than one month. 3. Find those who use a particular hashtag. What hashtags would your audience use? It's likely that your audience might be linked by certain products or events associated with specific hashtags. Brainstorm to find two to three hashtags that might lead you to your audience. Once you're ready, input them into a tool such as TweetBe, run a search and create a list of profiles that fit your specific needs. In this example, the hashtag #runchi was used on tweetbe.at to find runners in Chicago through TweetBe. 4. Organize your results. Once you've found profiles based on keywords, hashtags or locations, you'll want to organize them in a list. Of course, any Twitter user can use the platform's built-in "lists" feature to group certain profiles, creating up to 20 lists, with a maximum of 500 contacts each. For many this might be sufficient, but if you need more advanced list-management features there are plenty of tools to fill that gap, including SocialBro, Tweetbe.at, and Tweepi.com. 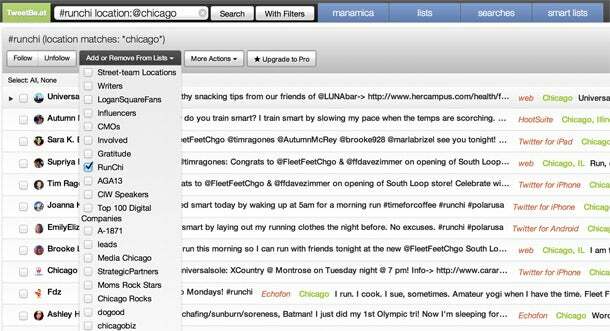 After creating a filtered list to find Chicago marathoners, SocialBro will let you add the results to a Twitter list. 5. Don't forget your tweeps. We've dealt mostly with finding new contacts but your old friends might also be a fit. Using any of the tools mentioned here you can use the "Advanced Search" to find your personal friends and add them to lists where they might fit. In creating a targeted Twitter lists, don’t neglect your older contacts who might be a fit for your new projects. In this example, Social Bro is used to find “Friends” who fit a particular profile. 6. Interact and monitor. After you build your segments, you're ready to interact with them. Use a dashboard such as HootSuite or Tweetdeck to import your new Twitter lists into columns so you can easily monitor your lists and build relationships through targeted content. Every few weeks or months consider updating your lists to ensure that your audience grows proactively. Go and get'em!